Emu oil seems to be “all the rage” among essential oils users these days. But what do you do if you have a religious or moral objection to the use of it? Devonian has spent over two years developing a solution for this problem, and they’ve come up with a great one: GREEMU. “What exactly is GREEMU?” you ask. It’s a combination of plant oils and butters that work together to simulate emu oil in both consistency and in what it does. As a member of the Schoolhouse Review Crew, we were blessed with the opportunity to review this new product, and the timing on that was pretty good since Munchkin had been struggling with overly dry, rash-like conditions on his hands and wrists. Because we reviewed Grade A Emu Oil from Koru Naturals (who distributes GREEMU) last year, I was in a good position to compare it to GREEMU oil this year. As you can see from the picture (hopefully), the consistency is very similar, as is the color. The oils feel almost the same on your skin, too. They rub in similarly and both absorb quickly and well. Not being big essential oils users, we used GREEMU primarily as a skin moisturizer. As I mentioned before, Munchkin had a pretty serious dryness rash going on, which he’d been using emu oil on. As soon as the GREEMU arrived in the mail, I had him switch so we could try it out. It worked just as well as the emu oil, and within just a few days, his chapped hands had healed! It was wonderful to see. In addition to Munchkin using this oil to heal his hands and wrists, I used it in place of any kind of lotion. I really like this oil for that use. It rubs in easier than lotion, and (so long as you don’t use too much) it absorbs quickly so you’re not left feeling greasy or oily at all. Small Fry was also suffering from some dry, cracked skin between his toes, so I applied GREEMU oil to his feet and massaged it in before bed each night. Other than it tickling, he really enjoyed having the oil applied. It helped him to relax at the end of the night. Because he usually wears footed pajamas to sleep, that helped the oil really do its job while he slept, and the cracks healed very well. Even though he’s mostly cured now, we still use the oil as a preventative measure. It’s better to keep the skin healthy than to have to work to heal it. The final way we used the oil was on poor baby Dragonfly. His skin is super chapped in the diaper area, so I used the GREEMU on the skin that was affected (without going into the actual area that’s covered by the diaper). I didn’t want to take any risks by applying the oil in such a sensitive area, so I kept the oil to his tummy, back, and legs. Within an hour of the first application, his skin was already showing signs of healing. What a relief to my mama heart! I’ll definitely be applying GREEMU to his belly with each diaper change for the foreseeable future to further aid in his healing and hopefully prevent further chafing. In addition to its moisturizing and healing properties, I’ve read that GREEMU oil is a wonderful carrier oil if you use a lot of other essential oils, but I can’t personally attest to that. Even though we’re not vegetarians and have no religious objections to using Emu Oil, I’m still happy to have a “greener” alternative that uses plant oils and butters instead of animal fat. As I mentioned before, it works just as well, so having a sustainable alternative to this great moisturizer is a good thing. 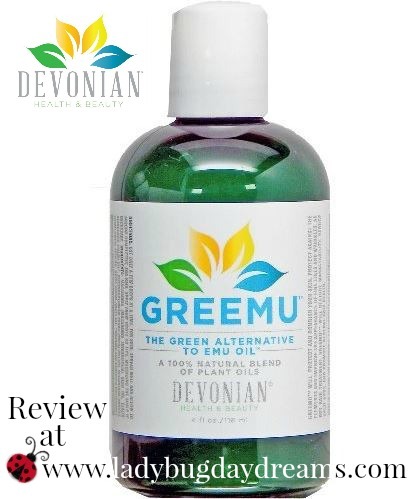 GREEMU comes in a 4-ounce bottle for $10.80; the same size bottle of emu oil is over $18, so in addition to being more environmentally sustainable, it’s easier on your pocketbook, too. If you purchase GREEMU through Koru Naturals by May 31st, 2016, there’s a 20% discount being offered. See their website for the coupon code. Other members of the Schoolhouse Review Crew are talking about GREEMU on their blogs this week, too. Head over to the Crew blog to find links to all of those reviews for additional thoughts and information.